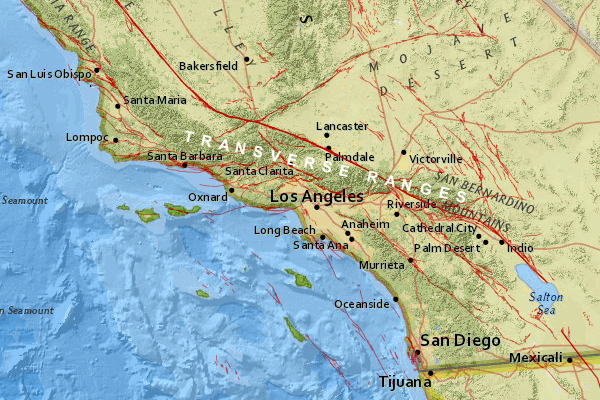 A new study argues that at least two large earthquake faults off the coast of Southern California can spawn damaging tsunamis that would wash over San Diego, Long Beach, Santa Barbara and other coastal cities. The study's findings could force changes in the disaster plans for these places. In the study, published by the Journal of Geophysical Research, a team led by Mark Legg scrounged years of data from different undersea surveys to analyze the offshore lands of Southern California in unprecedented detail. Looking both on and underneath the deep sea floor, Legg's team found some of the earthquake faults off California are longer and more threatening than previously thought – capable not only of generating large earthquakes, but of launching dangerous tsunamis toward the nearby coast. Legg's study makes two main contributions. 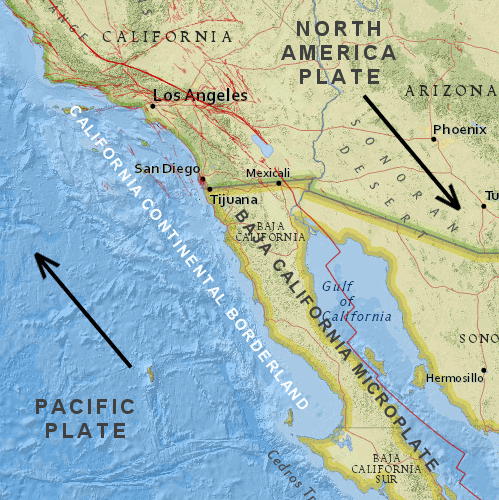 First, it builds a more accurate picture of fault activity where the Pacific and North America plates intersect, in the enigmatic region known as the California Continental Borderland. Second, it considers an underappreciated aspect of California's faults that geologists call transpression. 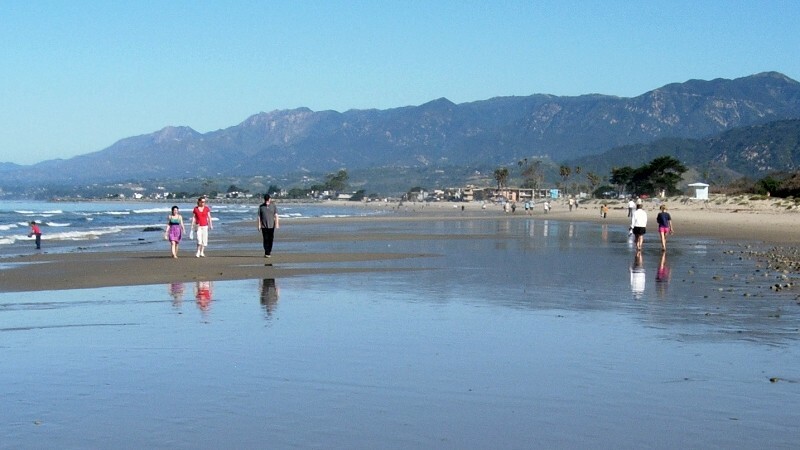 The California Continental Borderland extends from Santa Barbara down to Baja California, all submerged except for the Channel Islands. It's a peculiar piece of Earth's crust. It started out as part of the North America tectonic plate: a thick pile of rocks and mud on the continent's edge. Things changed about 28 million years ago as the Pacific plate took over offshore and the San Andreas fault was born. The Borderland splintered off the continent, and it's been moving northwestward on the Pacific plate ever since. That process is tearing the Borderland apart. Plate tectonic animations resemble the kind of mess you might see as tree trunks float down a river into an obstruction - a tectonic logjam. Today the Borderland is a badly cracked region. 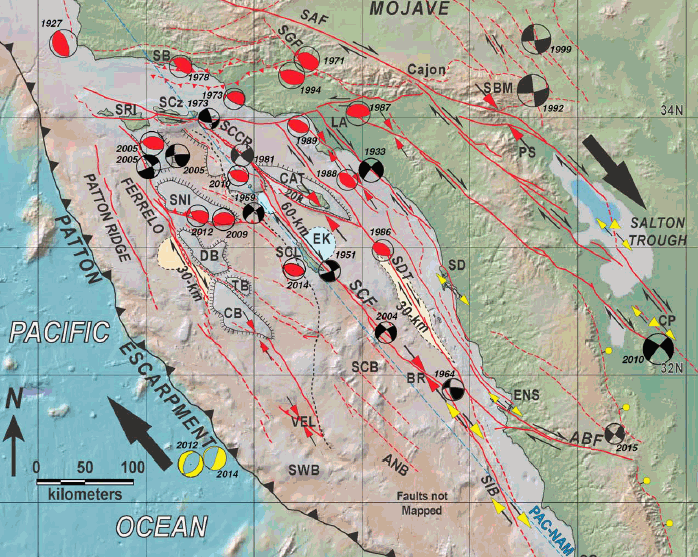 Legg's paper is a detailed description of two large faults in the seafloor of the Borderland: the 110-mile Santa Cruz-Catalina Ridge fault ("SCCR" on the map), and the 220-mile Ferrelo fault zone, extending from Santa Rosa Island to the deep Velero Basin, in Mexican waters. These faults are jagged lines built of many different segments. Seismologists know from recent research that disjointed-looking faults like these can rupture along several segments at once, adding up to a very large wallop, approaching magnitude 8. And Legg's study shows these faults are currently active. When the two sides of the fault slip past each other like traffic on a two-way street, we call that motion shear. (Actually, physicists call it shear; geologists call it transcurrent motion.) When the quake moves the land up and down, we call it compression. Transpression refers to that combination of shear and compression. For instance, Legg notes that the 1989 Loma Prieta earthquake directed part of its energy into uplifting the ground—and because some of that ground was offshore, it produced a tiny tsunami an inch or so high. Vertical changes in the land are always part of transpression, and its effects are especially strong in the Borderland. The Channel Islands, for instance, have been tilted and lifted above the sea as one consequence. Many more undersea mountains and basins show its effects. It is the thrust part of transpression in the Borderland that threatens to make tsunamis. Thrust-heavy fault segments, or separate thrust earthquakes, are what raise or lower the seafloor and push the overlying seawater into tsunami waves. And they do so over large areas at once. Legg thinks the magnitude-7 Lompoc earthquake of November 4, 1927, may have been such an event. "The actual location and causative fault is still controversial and may never be completely resolved. The important point is that seafloor deformation of the shallow continental shelf produced a 6-foot tsunami on the adjacent coast." Legg's work suggests that, while the Borderland would not unleash a tsunami like the wave from the magnitude-9 monster quake in Japan, it still poses a significant risk of quakes that would cause large tsunamis several meters high.